WARN  23:15:30,558 RestStorageService - Adjusted time offset in response to RequestTimeTooSkewed error. Local machine and S3 server disagree on the time by approximately -1894 seconds. Retrying connection. by approximately -1893 seconds. Retrying connection. I will be grateful if you could let me know if I'm doing something wrong, and if should be worried about this. Thanks a lot for the quick reply. I do have internet connection, so will try understand why it happens. I can use the output that were generated - right? Yes, your output should be fine -- it's just the report upload that didn't work. It may just have been a transient issue on the amazon cloud side. If it doesn't happen again, don't worry about it. Can you tell me why gatk try to upload a report to the amazon cloud. Is it for debugging purpose? Yes, and to collect general usage statistics. It helps us understand what tools people use the most and what are the most common error modes. It can be turned off if it causes trouble, but we do prefer to have it on because the data is useful and helps us improve the software. WARN  12:24:46,516 RestStorageService - Adjusted time offset in response to RequestTimeTooSkewed error. Local machine and S3 server disagree on the time by approximately -1271 seconds. Retrying connection. As we are using a server cluster and I am not the administrator, I really have no idea how to solve this problem locally, I guess that only leave me with the option to switch off the phone home feature? Normally the failure of the phone home connection shouldn't be making the run itself fail. What you see there is just a warning about the connection failure, but if your run failed there should be more information in the console output about what is the actual problem that caused the failure. @Geraldine_VdAuwera, thank you for your information. However, whenever my job fail, that is the only warning that I saw. Most of the time, a re-run will solve the problem (as in, just use the same parameter and execute the queue) . That makes me confuse. I am trying to reproduce the error and maybe able to send the error log out. And the error is in the attachment. The first pircture is what I got when I did variant calling. The second is part of my snp vcf file. I hope both can do some help. What version of GATK are you using? This looks like an old bug. If the issue is just with your header, you can simply re-header it. @Sheila many thanks for your quick reply. And I still need your help. My gatk version is the latest. And is re-header means using picard tools(AddOrReplaceReadGroups) to re-header? If so, I have made a try but it still doesn't work. 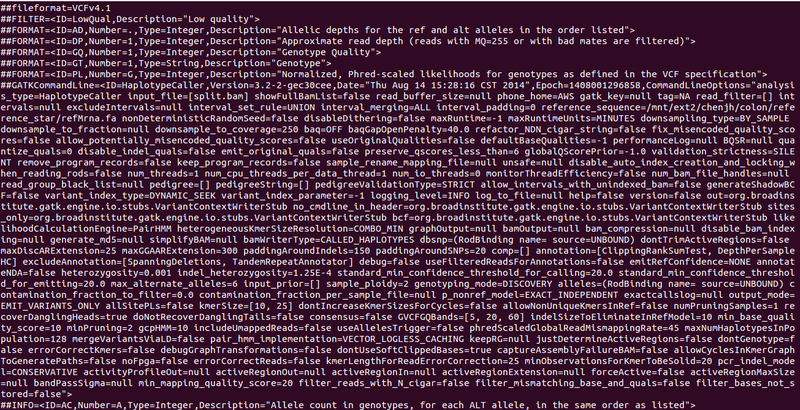 I follow the workflow: Calling variants in RNAseq in the gatk website. After "split”N”trim and reasign mapping qualities", I got the bam file. Then I use this bam file to call variant using gatk and samtools and I get 2 raw vcf files. The issue is that in snp.samtools.vcf, the PL number =-1. In the snp.gatk.vcf, the PL number =G, so there is a mismatch. You can just edit the snp.samtools.vcf PL number to G, and I think that should fix this issue. Specifically, look under 1. Meta-information lines for an idea of what the Number entry is.